The Paper That Cares. 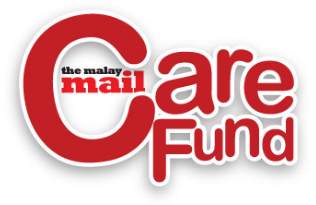 We are launching the new The Malay Mail Care Fund later this week to continue with The Malay Mail's work with people who can't afford the urgent medical attention they need. Our primary focus will be children from poor families in the Klang Valley, but there isn't a speed limit to caring. So far, the corporate support we've been getting for the launch has been overwhelming. The original Malay Mail Charity Fund was set up in 1991. Why Klang Valley? It should be the Long River in upper Rajang. There everyone needed help. In Klang Valley let the UMNO warlords who benefitted from the NEP to help. tak payah lah rocky....suruh pak menteri2 UMNO/BN derma 2% dari kekayaan mereka dah cukup ...anggaran nilai tu berbillion2 ringgit !!! Don't get politicians from both sides to be involved. And pastikan lah bantuan itu di nikmati oleh semua kaum yang perlu bantuan. yes, I agreed. Please ask UMNO warlords who have benefited from NEP (Never Ending Policy) to donate to the fund. oit cerita la sikit apa Malay Mail Care Fund tu dah sumbang, banyak mana dan kepada siapa? baru la suara sumbang tu sengap sikit.. Please extend cover to the most in need, not only those from Klang Valley..
Klang Valley already have many established and coordinated help-centres like "Pusat Rahmat" etc.. Many years ago I knew of someone having Kidney failure (poor family)and had to travel by bus all the way fm Pekan to GH for her weekly dialysis. And to imagine our Najib was their Rep then and now, what a Shame..
You should donate 50% or if possiable 100% of your salary paid by malay mail to this fund . You dont deserve being paid salary bro . Provision of basic medical services for the poor is the province of the Government. One of the things Singapore seems to have done well is provision of basic medical, housing, educational services for the people. Believe the PR is more committed to this in principle than the BN, and therein lies BN's achille's heel. During Dr Mahathir's decades these services were not affected.